One of the earliest and most talked about ideas for VR is “the YouTube of VR,” a service that would allow for people to upload and share 360 video content online – and make it viewable in virtual reality. The space rapidly became crowded with a number of different people taking approaches of varying success, then in March YouTube announced 360 video support and many assumed that the “YouTube of VR” would, in fact, be YouTube. With a seriously large purse, this could definitely be the case but that isn’t going to stop another contender who also stepped into the ring in March from trying to be the David to their Goliath. VRideo is a new online 360 video and virtual experience streaming service that has already jolted itself to the front of the class. Boasting a polished web UI, 3D video and WebVR support (meaning that it can support the Oculus Rift) – VRideo may be one of the most complete solutions on the market now. Alex Rosenfeld, VRideo’s founder and CEO, set out to create “the most fully built-out and realized product in the space for our creators and audiences.” Going about that, VRideo’s focus has been on two major things, creating the best possible user experience and providing content creators with the best possible toolkit – not just for uploading their projects, but for managing their presence online as well. For creators, this means access to a whole slew of features. These include things you would expect to see from a modern video site like the ability to manage multiple channels (Allen DeBevoise, the co-founder of Machima, is an investor – many credit him with establishing the multi-channel network on YouTube), playlists, detailed categorization, custom URLs, etc. Beyond some of the things you might expect, there are also some features that are unique to VRideo such as the ability to set the orientation for your video (i.e. you can set the start point so that the user is focused on what you want them to be focused on in the content right off the bat) as well as stereoscopic 3D video support. On the user experience side VRideo is also quite excellent. Currently the experience can be viewed using both a DK2 and a Google Cardboard with excellent support for both with WebVR. The process on desktop is stupidly simple – once you have set up WebVR all you have to do is press the little eye icon and ‘BAM’ you are in virtual reality mode. The VR mode even has a very basic UI (which will be improved upon soon) that allows you to pause and play the video, change the volume and browse a limited selection of recommended videos (based on what you are watching). This represents the barebones for what will eventually become a much more thoroughly built out UI in the near future. The team is also hard at work on an app for VRideo that will make the content more natively accessible on the desktop, with a more thoroughly built UI. This is part of the team’s effort to make the platform as universally accessible as possible, says Rosenfeld “We’re building our native VR experience to be easily extendable across the many VR headsets coming to market over the next year, including the Gear VR, HTC Vive, Oculus Rift CV1, and Sony Morpheus. We’re looking forward to being able to share more.” Right now the content can be enjoyed on DK2, Cardboard, and on the GearVR (by downloading the videos directly). 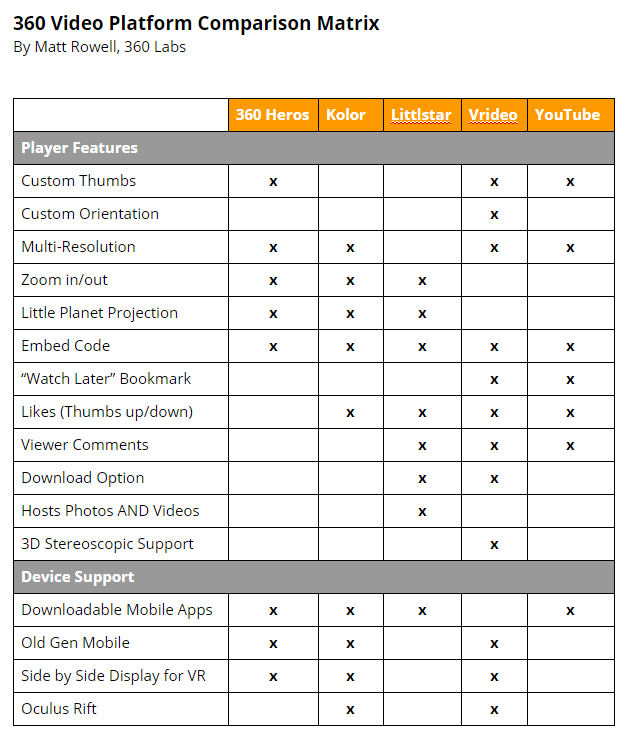 Currently, YouTube doesn’t support any of the major headsets natively, but that is likely to change in the future. To date, VRideo has raised over $1.8 million from a rather illustrious list of investors to help build this platform out. The list includes people like the Vice Chair of Viacom and CBS, the Co-founder & Chairman of Machinima, the Chairman of Buzzfeed, the Co-founder & CEO of Thrillist, the former CEO of the Huffington Post, the former Chief Digital Officer of News Corp, the former SVP of Technology at Time Warner, the Co-founder of PriceGrabber, and hip-hop legend Nasir (“Nas”) Jones. This investor list may prove to be one of VRideo’s secret weapons, as every one of these individuals has strong ties to the entertainment industry – and as the medium matures, access to high-end content will be key. Says Rosenfeld, “we have unique access to and relationships with creative, major brands, and media giants who are starting to activate in VR,” and those connections will be key. At this point, however, much of what is currently available isn’t worth watching, with stitching and other issues abounding on some of the most amateur content. That being said there is still some content worth highlighting. Browsing through the videos available I found a few that definitely stood above the rest, Chernobyl – a 360 experience taking you through the famous site by Cinemactive, for example felt quite comfortable with little noticeable stitching. Travel experiences also tend to play well, with the environment demos by Atmosphaeres being among my favorites. The good content, however, is still harshly contrasted by the bad and it would be nice to have a way that users could rate based on quality of the video itself rather than quality of content. Right now it’s far far too early to declare a winner in the virtual reality streaming service war. The battle lines are still being drawn and we are still at a stage where nobody has much ammunition, but the stockpiles of content are coming. Having used each of the available services for watching streaming 360 video, right now it is hard to say anyone is doing it better than VRideo, and with the improvements that are coming down the pipeline (we should be seeing a full preview of the desktop app at SVVR) that may not change for the foreseeable future.